PROVIDING PERMANENT HAIR REDUCTION YOU CAN RELY ON OR ITS FREE. "NOW OFFERING FREE HAIR REMOVAL IF YOU NEED MORE THAN 10 TREATMENTS, ASK IN CLINIC FOR DETAILS"
Cosmedix Laser Hair Removal is safe for all skin types & is a permanent solution for complete hair reduction in some cases for life. We utilise the latest TGA approved laser technologies so you can be assured safety and results is what you will get and not just hope. We offer a personalised service that is not rushed providing maximum results & promising satisfaction. Many clinics or salons claim they can achieve long term hair removal results but time and time again we see this is simply not the case. Many clients have been frustrated with false claims and given in on cheap treatments but what they do not realise is that it takes years of experience and the right technology to achieve safe long term hair removal. This is where Cosmedix is different, we DO have the experience and assure successful results with our medical guidelines. Discover the difference and feel the results. Simple click on the “Book Now” button above or call us to schedule a free, no obligation consultation today. We specialise in both female and male hair removal treatments by creating that smooth look that is so in-demand these days, throw away the razors and feel the difference with hair free skin. Cosmedix offers the best in laser hair reduction technology for all skin and hair types... providing hair free solutions for everyone. Cosmedix is bringing MEDICAL GRADE LASER at a price everyone can afford! Come in for a consultation, and you will be asking yourself the same question we are......why wax?....when our treatments are so affordable and provide long lasting results! ​"I have had a brazilian bikini wax every four weeks for the last 15 years of my life! I read about laser treatments by Cosmedix using the latest laser hair removal technology that claimed to be quick and virtually painless and I thought I would give it a shot. I was very sceptical and I was incredibly nervous when the clinician stood over me ready to go! But to my surprise the treatment was less painful than a wax, it felt slightly warm like a hot stones massage, but that was it and it was over in about 10 minutes. After 3 treatments the hair growing back was so fine it was barely there and after my 7th treatment... nothing left which is amazing considering my hair is quite coarse. I used to suffer from ingrown hairs but now I am just lovely and smooth. It’s saved me time and money and I just wish I had known about it sooner "
To successfully remove unwanted hair by laser treatment, the clinician must carefully apply energy so that hair follicles are damaged but nearby skin and tissues are spared. This can be more or less difficult depending on each patient’s individual characteristics such as skin color, hair color, and hair thickness. 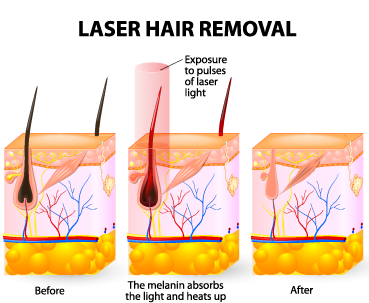 When treating hair with a laser, the clinician can account for these characteristics by adjusting treatment parameters such as fluence, pulse width, and repetition rate. Many in-effective devices are limited in their utility because the different parameters cannot be adjusted independently (if at all). Understandably, treatment of darker skin is more challenging due to the higher concentration of melanin in the skin as a competing chromophore; in those cases treatment may be too painful or cause unwanted side effects. However, at Cosmedix we use the latest technology and adopt the know how from experienced specialists in the field to make sure you can rely on excellent results every time. In the past, a bikini wax involved simply removing the hair which showed outside the line of your underwear/ swimsuit. 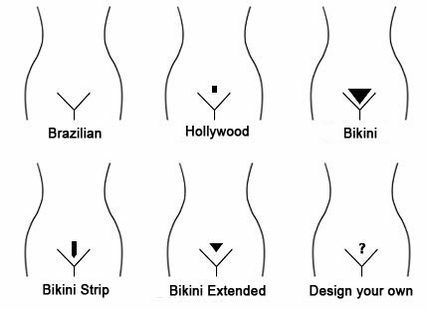 However the Brazilian has dramatically altered the way we dare to bare and with revolutionary Laser therapy you can remove all hair or just leave a strip and experience fast and effective permanent results! Our highly trained clinicians will ensure your comfort at all times during the treatment and will be able to answer any question you may have regarding other treatments or after-care. Number of treatments: Permanent hair reduction leading to smooth hair free skin can typically be achieved between 5-9 sessions.. Varying factors may require extra treatments once a year. Pre-treatment considerations: do not tan, shave 24-48 hours prior to the laser treatment. You can also trim the hair just prior to treatment. Treatment Time: 5 - 40mins depending on areas treated. day 3+ - itching, mild crusting of the skin, dryness, blistering, redness. Potential side-effects: skin pigment changes, skin sensitivity. Note: Side effects are temporary or can be easily resolved. Symptoms are well tolerated and localised to the treatment area only. Following recommended skin care instructions will ensure skin healing is fast and may prevent any potential side-effects.